LAWRENCE — As the World War I military draft brought to the forefront the high rate of venereal disease among the civilian population, states began to enact measures to quarantine people and begin forms of treatment to try to control syphilis, gonorrhea and other potential outbreaks. However, a University of Kansas researcher has documented examples of how this process continued well into peacetime and how these laws were generally enforced along lines of gender and class, especially punishing poor women. Nicole Perry, a University of Kansas graduate student in sociology, studied Chapter 205, the state of Kansas quarantine law that took effect in 1917 and led to approximately 5,000 women being imprisoned at the Women’s Industrial Farm in Lansing between 1917 and 1942. Have you seen The Guardian‘s amazing interactive guide to the first world war? It’s worth checking out! Ten historians from 10 countries give a brief history of the first world war through a global lens. Using original news reports, interactive maps and rarely-seen footage, including extraordinary scenes of troops crossing Mesopotamia on camels and Italian soldiers fighting high up in the Alps, the half-hour film explores the war and its effects from many different perspectives. You can watch the documentary in English, French, German, Italian, Spanish, Arabic or Hindi thanks to our partnership with the British Academy. 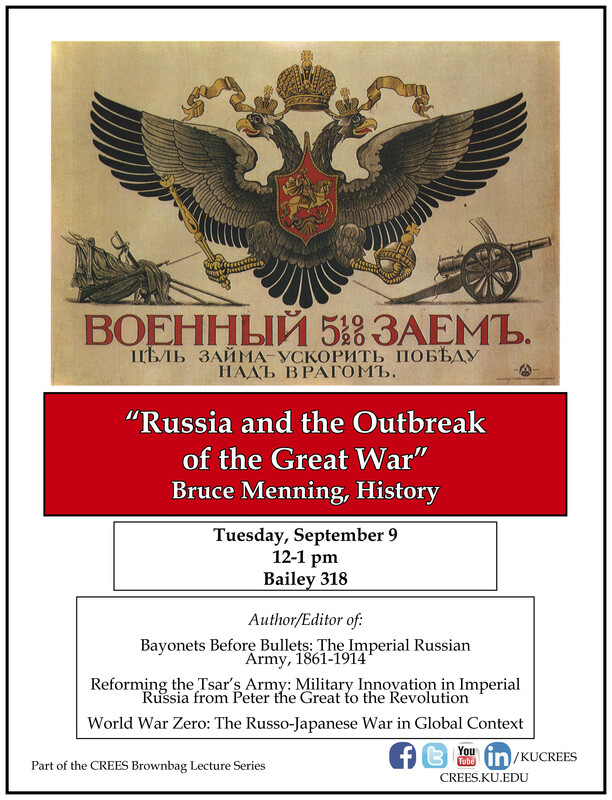 On September 29th, KU Today published a fantastic write-up of KU WWI Centennial Commemoration events for 2014-15. Read the article here. In connection with the performance “Basetrack,” the Lied Center will display the artwork of local veterans throughout the building. Through letters, artifacts and photographs, the exhibit shares the stories of the men who served overseas, life on the homefront in Douglas County and local memorials honoring those lost in conflict. Location: Watkins Museum, 1047 Massachusetts St. The Elgar Concerto Within the Context of WWI, 6:30 p.m.
Reading: The Poetry of the First World War, 4 p.m.
Panel Discussion – Media and Military: A Tentative Alliance, 5:30 p.m.
Modern warfare relies on a relationship between the military and media, both of which seek to serve the public. This panel discussion will focus on this sometimes difficult and definitely complex relationship. Panelists will include: cast members of “Basetrack”; Barbara Bennett, associate dean of KU’s William Allen White School of Journalism & Mass Communications; and Mike Denning, director of the Office of Graduate Military Programs. Following the panel discussion a reception will be held for the cast of “Basetrack” at the VFW. Location: Watkins Museum, 1047 Massachusetts St. Combat Veterans Courts: Leave No Veteran Behind, 7 p.m.
War Termination – Compare and Contrast Vietnam to Afghanistan and Iraq, 7 p.m.